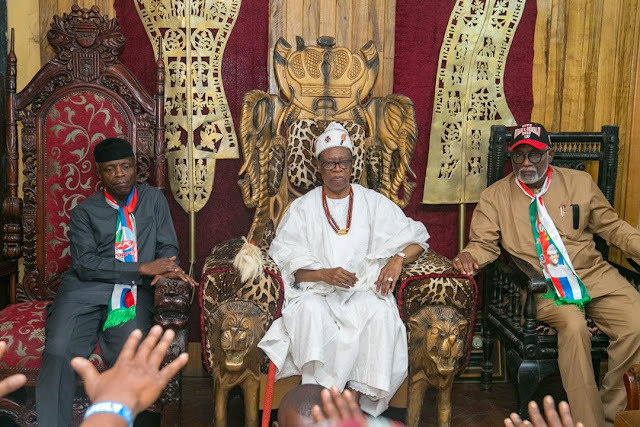 Vice President, Yemi Osinbajo, on Friday, 18th January, 2019, was received admist pomp and peagantry at Owo, during his visit to the ancient town in continuation of the door - to-door campaign for the President Muhammadu Buhari's re-election. Owo is the home town of Governor Oluwarotimi Akeredolu, SAN. The ancient town was agog as the Vice President visited the Palace of Olowo of Owo where he addressed the Monarch and other traditional Chiefs. It was a lock down as both vehicular and human movement was halted for over 30 minutes. Governor Akeredolu appreciated Osinbajo for visiting the town. The Governor who spoke in Owo dialect assured the Vice President of the support of the people of Owo and the entire state. The Vice President said the coming election is for the progress of the town, Yoruba nation and the entire country. He said " Even Buhari's enemies know that he's truthful and has integrity. Where we are today, we need a truthful person to progress our nation. Nigeria is blessed, but there is too much corruption and that's why we must choose truthful leader. " At a town hall meeting where the VP addressed a mammoth crowd who filled the expansive Hall of Mydas Hotel, Owo, he reeled out the achievements of the administration of President Buhari. He explained that the Buhari's administration will do more in term of infrastructural developmental and Social Intervention Program if re-elected for a second term. The Olowo of Owo, Oba Folagbade Olateru Olagbegi thanked the Vice President for his visit. The monarch demanded more Federal presence in Owo.